There is a demand for developing novel approaches in battlefield scenarios to accurately and rapidly detect traumatic brain injury (TBI) and thereby, to recommend the appropriate next level of care. The current gold standard for TBI detection is limited to non-portable and expensive imaging modalities such as computed tomography (CT) and magnetic resonance imaging (MRI). Additionally, CT and MRI cannot be repeated on an hourly/daily basis to detect gross anatomical changes due to temporal progression of TBI. 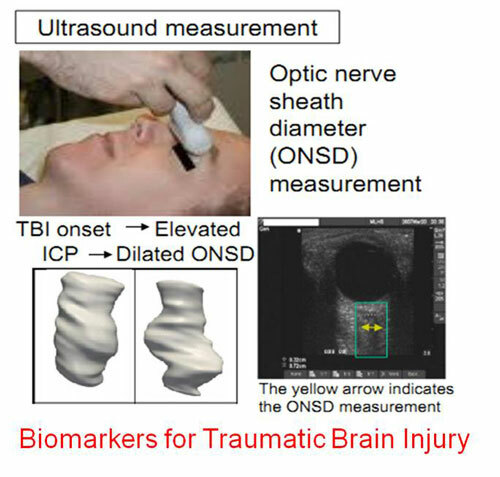 UC has developed novel markers based on portable ultrasound of the optic nerve sheath to accurately and robustly classify patients with TBI. We are currently collaborating with Georgia Health Sciences University, Augusta, Georgia to build a portable ultrasound TBI screening tool with decision-support capabilities. On-site diagnosis of TBI in battlefield and ambulatory scenarios. In-built predictive algorithm to predict the progression of TBI in patients within the next few minutes or days after injury. Decision-support platform to classify the severity of TBI and recommend follow-up actions.